The test material is comprehensive. Students have an average of one minute to answer each question. There are some truly challenging questions. First, the ACT Mathematics Test assesses mathematical skills students are expected to have acquired by the start of their senior year of high school. Since many college-bound students begin preparing for and taking the ACT well before then, this means that tenth or eleventh-grade students would likely need more test prep to fill in the gaps between their experience levels and their older peers. Then there’s the issue of time. The ACT Mathematics Test challenges students to tackle 60 questions in 60 minutes. Even with calculators (which are permitted throughout the entire test), students may struggle to finish. Last but not least, the ACT Mathematics Test includes some questions that are downright brutal. Sure, the ACT test makers avoid many of the tricks and puzzles that tend pop up on the SAT Mathematics Test, but there are still plenty of complicated concepts that could potentially pop up on test day. Despite all these challenges, there is some good news. The ACT’s format can actually be net positive for students who know how to take advantage of it. Test prep tutors equipped with a comprehensive test prep curriculum and some targeted strategies can ensure students walk into their test centers ready to do their best and outperform their less-prepared peers. 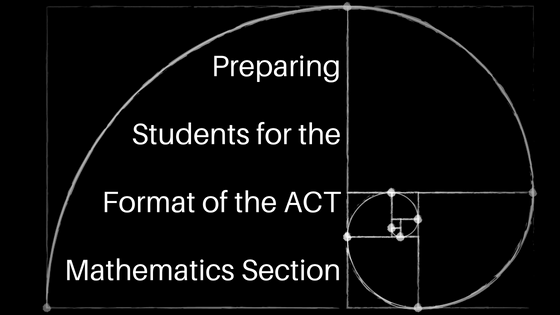 When preparing students for the ACT Mathematics Test, keep these areas and quantities in mind as you decide how to steer the test prep process. For instance, trigonometry may be a struggle for some students that have not yet been exposed to the joys of graphing trigonometric functions or balancing complex trigonometric equations. That said, with only a handful of trigonometry problems appearing on each ACT test, tutors must weigh how much of their test prep curriculum and time should be spent on such a specific area versus other areas of need. Utilizing an aligned and complete curriculum product like the 100% custom branded materials available from Clear Choice Prep helps ensure that both tutors and students focus their efforts on the areas of greatest potential improvement, weighted proportionately to the actual test content. Using our state-of-the-art software can make it easier to select the content areas ripest for improvement and focus a student’s time and energy accordingly. Schedule a demo to see how Clear Choice Prep is prepared to help your tutoring business do exactly that! Sixty minutes for sixty questions is not a lot of time. Even strong math students can be derailed by the time crunch on the ACT Mathematics Test. While content is the focal point of strong test prep, students also need coaching on how to work quickly and efficiently when the pressure is on. Skip reading directions. The ACT provides practice materials that include the same directions test-takers will see on the actual exams. The curricular materials from Clear Choice Prep include these written directions as well. The best tutors refer their students to these exact directions repeatedly throughout the test prep process. This way, students can skip over them on test day and save some precious time! Don’t let calculators become speed bumps. Sure, calculators are permitted on the entire ACT math section, but that doesn’t mean they are required. Students need guidance on how to judge when a calculator is a help or a time-eating hindrance. Memorize formulas. Unlike the SAT, ACT doesn’t provide a reference list of mathematical formulas for test takers. While some problems do supply a relevant formula here and there, there’s no guarantee what will be made available on test day. As such, the best bet is for students to memorize as many of the relevant formulas as possible (more on these in our next post!). Be sure to subscribe to our test prep blog so you don't miss out on more test prep tips and strategies! There are three tiers of difficulty on the ACT Mathematics Test. There are 20 easy questions, 20 medium difficulty questions, and 20 difficult questions. What’s more, the test itself flows from the easiest problems to the hardest. Students should be prepared to use this format to their advantage. Earlier problems are likely to include fewer steps and deal with concepts most familiar to the average high school student. Ideally, students should be able to complete the first third of the test without much trouble and with some extra time in the bank for the later sections. The rest of the test gets trickier. Problems involve multiple steps and increasingly challenging levels of mathematical reasoning. Students that are accustomed to this escalating difficulty will be able to make savvy choices when it comes to grinding out a difficult question or saving it for after they have successfully grabbed all the low-hanging fruit. Offering full-length ACT practice tests is a great way to familiarize students with this difficulty curve as well as assist them with making snap decisions about how much time to put into solving a particular problem before moving on. Say what you will about standardized tests, one of their greatest blessings is that they are…well…standardized. Content and data should drive the bulk of a student’s test preparation, but building familiarity with the format and structure of a test like the ACT Mathematics Test is just as important. Students with a strategic understanding of the test will always outperform those that do not.